Anonymous, the hacker group that has threatened to attack the Malaysian Government portal, just announced its reasons. The “Anonymous” group is acting against what it claims are various acts of censorship by the Malaysian Government which announced last week, and also because of the recent move to block filesharing sites, like The Pirate Bay, MegaUpload, in Malaysia. Ohh no! Is this good or bad? Even this file sharing sites are blocked, there’s always way to bypass it! People will come out will guide on “How to bypass DNS block” or “How to access blocked file share websites” to help internet users to get around it. Just some simple DNS bypass will do the trick or just find some new file sharing website that offering the same service? How about other file sharing site like dropbox and box.net etc? Are you one of the affected internet user by the block of fileshare website? I’m not as I don’t download much but was affected by the online streaming of TVB drama series as most of the latest drama series do not available for Malaysia anymore! Fear not of coz I have my own way to by pass and to grab the content and continue streaming of PPS.tv or Tudou. PETALING JAYA: A hacker group has threatened to attack the www.malaysia.gov.my website. It posted the threat in a graphic on this website, http://i.imgur.com/PTFWh.png. Mikko Hypponen, chief research officer at the F-Secure Corporation – a computer security software company based in Helsinki , Finland – tweeted about the threat at 4.42am Malaysian time. But there has been an uptick in “hacktivism” these past weeks, where hacker groups have targeted various organisations for political purposes. Hackers have attacked the International Monetary Fund and Sony PlayStation Network, as well as the networks of aeronautics company Lockheed Martin Corp and Citibank in North America, amongst others. Anonymous was blamed for the hack into the PlayStation network but a spokesman for the group has denied involvement, saying that its aims are political. Spain, however, has arrested three suspected members of the hacker group for that attack. Anonymous apparently comprises a vast number of hackers in various countries, who have been organised into cells that share common goals. They operate anonymously but in a co-ordinated fashion. Meanwhile the AP reported from New York that a group of hackers has gained access to the websites of the U.S. Senate and video game company Bethesda Softworks, the latest in a series of cyberattacks plaguing a broad range of online victims. The group, which calls itself Lulz Security, posted what it called a “small, just-for-kicks release of some internal data” from Senate.gov on its website on Monday. A representative from the office of the Senate sergeant-at-arms did not immediately return a phone message for comment Monday afternoon. Bethesda acknowledged the intrusion in a blog post Monday, saying hackers may have gained access to users’ names, email addresses and passwords. The company said no credit card data or other financial information were compromised. Lulz Security has also recently claimed responsibility for breaking into the websites of PBS, Sony Pictures, Nintendo and others. Meanwhile, it’s unclear who was responsible for a recent cyberattack on the International Monetary Fund’s computer system or the one on Citibank that stole about 200,000 credit card account numbers, customer names and email addresses. Shaul said the recent string of attacks take advantage of insecure systems. While companies are protecting the perimeter of their computer systems, once hackers get in, “everything is there to own,” he said. It’s the equivalent of a bank putting a guard at the door and leaving all the money in a pile instead of in safes and vaults, he added. Bethesda declined to comment beyond its blog post and did not say how many users were affected. Bethesda, behind games such as “Brink” and “Fallout: New Vegas,” is a subsidiary of ZeniMax Media Inc., based in Washington, D.C.
PETALING JAYA: Anonymous, the hacker group that has threatened to attack the Malaysian Government portal, just announced its reasons. According to its statement on the Pastebin website, the group is acting against what it claims are various acts of censorship by the Malaysian Government, and also because of the recent move to block filesharing sites, like the Pirate Bay, in Malaysia. Anonymous also accused the Government of censoring movies and television shows, and for restricting the Internet, which it says is a basic human right. “We fear that if you make further decisions to take away human freedom, we are obligated to act fast and have no mercy,” the group said in its statement on Tuesday. The message was also uploaded on video-sharing site YouTube. It featured a digitally-generated voice that read out the group’s message. 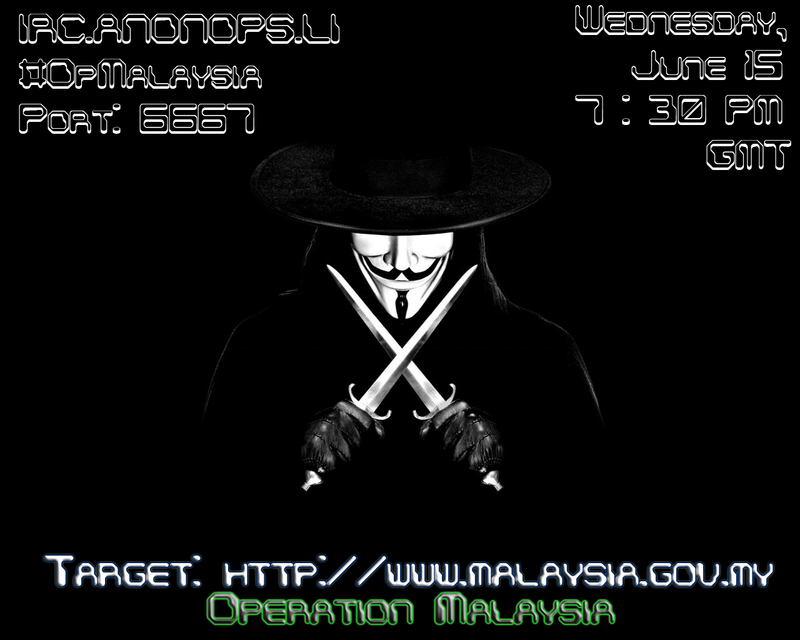 Anonymous will launch the attack at 7.30pm GMT on Wednesday (3.30am Thursday Malaysian time) and has named it “Operation Malaysia.” It posted the threat in a graphic on this website. Mikko Hypponen, chief research officer at the F-Secure Corporation – a computer security software company based in Helsinki, Finland – tweeted about the threat at 4.42am Malaysian time Tuesday. Meanwhile, online news site Epoch Times reported that Anonymous selects target countries based on input from users in those countries. 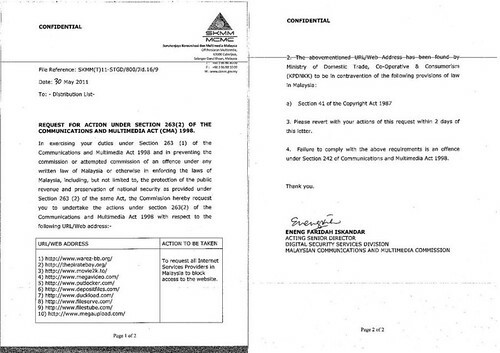 However, the report said, the hacker group has declined to say if there are any Anonymous members in Malaysia. In the exclusive interview with Epoch Times, Anonymous said it expects the Malaysian Government to “not be happy” over the coming attack. 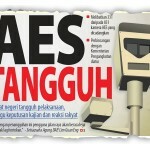 According to the report, Anonymous has reminded its members taking part in Operation Malaysia to use Virtual Private Networks to encrypt their network connections, and to transfer data from remote locations that cannot be accessed without authentication. This would help protect the identities of the hackers and their locations. The attack on the Malaysian Government portal would be in the wake of several earlier attacks by Anonymous on Turkish Government websites for alleged Internet censorship. According to recent news reports, the Turkish Government has arrested 32 people, suspected to be members of Anonymous, after “Operation Turkey” disrupted a number of official websites in that country. THIS IS GREAT! I SUPPORT YOU ALL! HACK MALAYSIA GOVERNMENT!!!!!!! did you know? those people that call their self a hacker are a bunch of idiots people. they were no hacker at all. if they were a hacker they should be know we don’t even care if our gov block those site. cause we still can enter it anyway. we are the hacker, we Malaysian people are advance hacker. we not like a bunch of stupid people called their self a hacker then cry when gov blocking those site. did you see any protest happen in Malaysia when they blocking when they block those site? nil ? we don’t care..
Only a bunch of stupid ppl don’t know how to bypass it…but they will know how to bypass it soon. and some of malaysian ppl called their self a hacker group but they protest it, you better go to school and learn it fool. what a shame to malaysian ppl. don’t be the one that called them self a hero that safe OH! Media Fan Page. cause hes the one that hack and used other country named. to make provocation between 2 country. so stupid. the truth is this anonymous group has been present all along and are fighting for the freedom of internet. you misunderstood them. any bozo can use a proxy, ssh tunnel or vpn to bypass and get to those sites but what they are saying is we do not have to. we have a right to access all contents, be it pirated or not. no government should bow down to corporate and capitalist bastards. internet is slow now, since the war has commenced between hackers and govt dogs. much more dangerous than US-Soviet Union cold war. holy crap cant they just let us play online games without lag??? 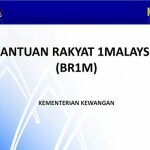 Malaysian government chosen by the rakyat. For those Malaysian involved in hacking for the intentions of havoc the government server, I consider them as the traitor of motherland. I mean, the land our mother, sister, father or any of our folks were born. If they don’t agreed with the government’s policy, they should do vote the side that they think will bring the justice and fair for them. Do you think the election is fair enough? 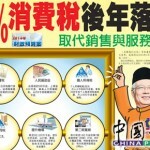 Do you think that every Malaysian is satisfied to the result of the election? Why do the government websites easily been hacked? Is it safe to live in the country that even security of government website cannot be protected? I’m waiting since 3:30am still nothing going on. Well, that is what election is all about. 1. Both side (at least) have their opportunity to do the best to win people votes. 2. Tell me, how can you satisfy everyone? I saw the government heard people voice. Then they do the actions. That is what I want. What else do we want? 3. Even the CIA’s website has been hacked before. Source: http://thenextweb.com/industry/2011/06/15/senate-website-cia-gov-hacked-lulzsec-claims-responsibility/. What is so weird if this happened in Malaysia? We should ask why the hacker do that job? It’s annoying. You may ask why the government block the website? It is the law. The law being created by the rulers to protect those deserved. And the rulers being voted by the people. Remember that. Thats why I said, people should vote the side they think will bring justice to them. The power is on their hand. 4. Our government is not a stick. They has their agencies to do their specified tasks. What’s important is how they response to the attacks. 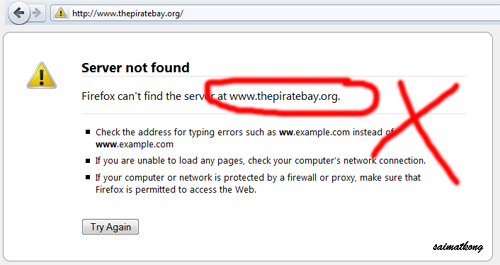 And what can I can saw, the websites are recovered now. Nobody is perfect. Take care of ourselves. Then the world are peaceful. I’m not saying im right. You may choose to believe or not. If you are not satisfied with the government, dont make a mess. Do a change with the peaceful way.